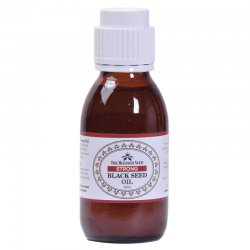 Our Strong Black seed oil is the most concentrated form available in the world. We maintain the high strength and quality by sourcing the most suitable seeds and working closely with our farmers. Every batch of oil produced is analyzed to ensure we provide a consistent high strength. This unique oil is packaged in a dark glass bottle to protect it from light oxidation and to help preserve its integrity. It also comes equipped with our exclusive anti-spill pourer so you don’t waste a single precious drop. Even though our Strong blackseed oil is not certified as organic at the moment, we have put this process in motion. Meeting EU regulations for organic certification can take a few years and we will update the progress in our newsletter. Our Black Cumin Seed Oil is the highest quality oil on the market – this is what we work very hard to maintain. We are so confident about our product, we gladly offer a full 1 year guarantee. Using only the finest Black Seeds from selected suppliers around the world, we’re able to produce 100% pure Strong black Cumin seed oil. It has taken us years to get to this point and we now have the suppliers who know our needs. We have built up the connections with our farmers who ensure we receive the best quality black seeds necessary to produce our oils. Our oils are manufactured using a slow, cold-pressed method which helps preserve the volatile components found in the oil. Why? Because research has revealed that most of the potent & fruitful activity found in Black Cumin Seed Oil resides in its volatile oil. We also go one step further. We press our oils at the slowest speed possible. That means our oils are well under the required 40 degrees celcius to create a cold pressed oil. Mild black seed Oil typically contains 1.2% of volatile oil. 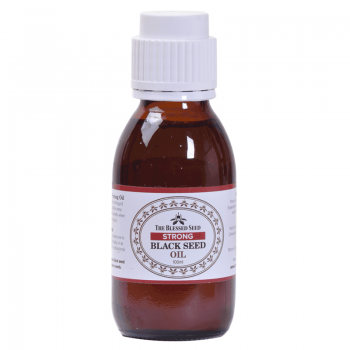 Original black seed Oil typically contains between 1.5% – 1.7% of volatile oil. 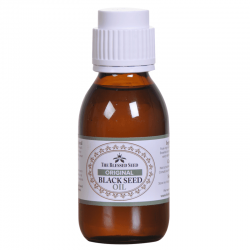 Our Strong Black Seed Oil typically contains 4.3% and 4.9% of volatile oil. (potentially 3-4 times more powerful than most oils on the market!). At our manufacturing plant, the blessed seed oil is processed in the most hygienic conditions (certified by the German Government) and bottled as fast as possible after pressing. This again helps to preserve the volatile components in the oil. 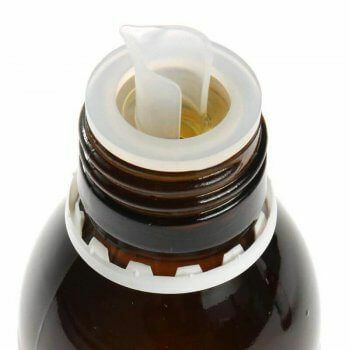 Our Oil bottles come fitted with safety caps. Our 100ml Strong BlackSeed oil bottles also feature our unique pourer. It is designed to give you a cleaner pour of the product and also help avoid spillage/waste. This is a natural product and works naturally. For certain ailments, you will not see results overnight. Especially if your ailment has been there for a long time. But it does work. Great product, the best black seed oil on the market. Ordered both original and strong oil, and both were very satisfactory. 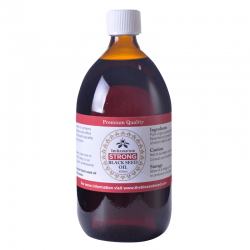 I take original oil everyday and use strong oil for my knee and jaw problem. It eases the pain of the joints and I think this one works for my skin health as well. Very good products! This the best discovery my husband and I ever made!! 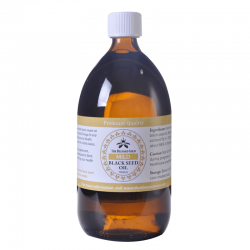 My husband stumbled across the black seed oil and its many uses for various conditions in the body. After doing research, we discovered the blessed seed company. They’re the only company that we’ve found that produces the oil correctly and protects the volatility of the oil. I ordered the strong oil which definitely has a strong taste, but tolerable. We have definitely experienced a great change in our eating habits and felt better all round, healthwise. We’ve discovered that while using the oil as a supplement, we’ve seen the fat disappear and our metabolism has increased. Using it on our bodies gives smoother skin, especially on the bottom of the feet (no callouses or corns). On the hair, there’s a beautiful shine to the folicles and it encourages healthy hair growth. I also noticed that it helps me focus better and I’m able to be more productive on my job. This was only after using the black seed oil for 3 weeks……I’m a believer! This product is an absolute staple for my family and I will keep ordering from the blessed seed. It’s been about three weeks that I am taking the strong black seed oil. I bought this for my blood pressure and arthritis pain. My blood pressure has been in control now since last 10 days, I only take my blood pressure meds on alternate days now instead of taking daily. My sleeps are also better now and my back pain are not there anymore in morning. I do suggest mixing with something to take it. Definitely makes it easier to go down. A few months ago I developed an itchy scaly rash on my face. I tried many natural oils and creams to get rid of this rash, but nothing worked. Then I remembered a friend had given me a bottle of black seed oil which I had left in my fridge. The very first time I used it, the rash on my face literally just peeled away. I was so amazed, I carried on using it and my skin cleared up within days. My bottle has finished and I have ordered some more which I will be using internally for hypertension. I had pomphlyx excema on my hands and the doctor gave me steroid cream which managed it but it kept coming back it was painful and awful to manage. My mother had told me about this black seed oil and purchased it for me her knowledge on it had come from the fact that in Islam it is recommended by the Holy Prophet Muhammad pbuh who said “Hold on to the use of the black seed for indeed it has a remedy for every disease except death.” “Hold on,” indicates a long-term use and should be well observed. A long term use means to take regularly. Hadith (Sayings of the Prophet Muhammad (SWS) narrated by his companions. )7.591 So I used it and it has been amazing so far really controlled the excema and is kind to my skin. I’m still using it. The best of the best. 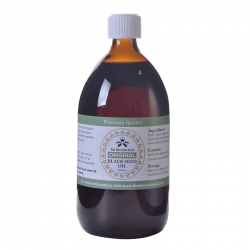 I had a large painful swelling on my left breast and use this oil. Both pain and swelling gone gone gone. Tried all 3 Strengths of The Blessedseed Blackseed Oil. It’s My little Miracle in a bottle! I cant emphasise how amazing this oil is! I buy both Size bottles in the Blackseed oil Original; but prefer the 100ml bottles with the pouring aid – makes it easier to pour the oil onto a Teaspoon without spilling. For those with Sensitive Tummy’s…. I had one too. Bad Reflux and Burping etc. I no longer need Medication for the Bad Reflux & Tummy issues. 1st time users may experienced a little enhanced Burping or some stronger after-taste of the oil… Please know it will pass soon enough if your persevere; its just your body adjusting to the Blackseed oil. The STRONG Oil I have purchased and wish I could use all the time; but I find it a little too heavy for me at the moment. I wont give up, I’m going to build myself up to be able to use this instead of the Original strength, because the Strong has 3+ x the beneficial Thymoquinone benifits. BEST OF HEALTH 2U all <3 Kaz. I reasoning for using the strong black seed oil is cause 1) I have beginning stage COPD. 2) skin cancer on chest and neck 3) borderline cholesterol.I been taking 1 teaspoon 3x a day. After 2 months I noticed my breathing is so much easier when I go hiking. My lungs feel so much better, not struggling to go up inclines anymore (unbelievable) I am so thrilled. I also had blood drawn by lab and for the 1st time in 5 years cholesterol reading normal. (Im totally amazed). 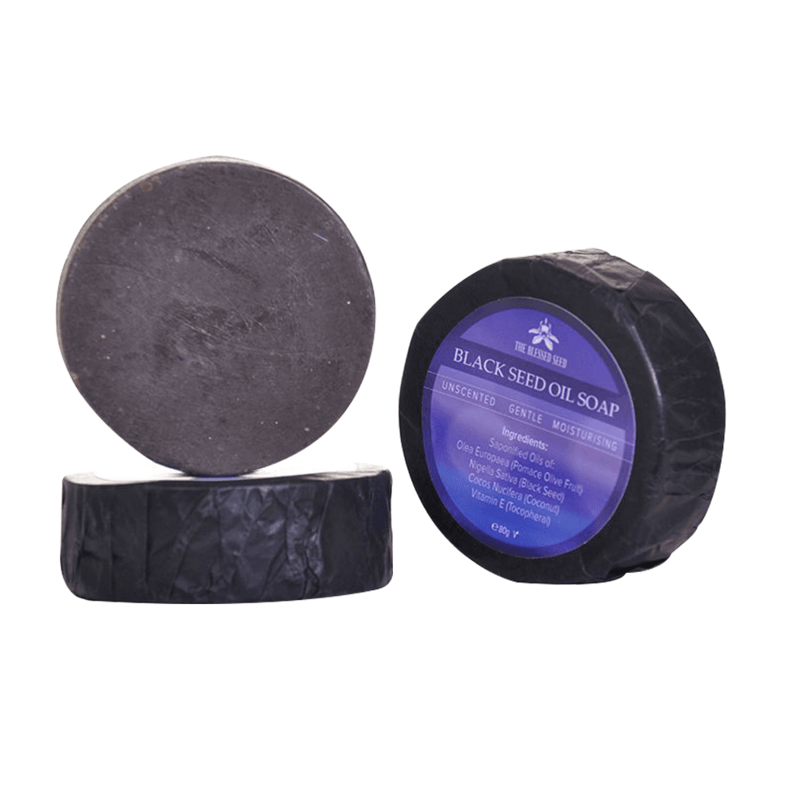 I also using black seed soap for the skin cancer and amazingly enough its feeling and looking way more better. Im gonna keep this up like a ritual and cant say enough about the lab results plus the evidence of my lungs improving so much , my quality of life is so much better. I cant say enough. I also put some in lotion and on my face and body. I also add alittle in my hair when I wear a bun , seems stronger, shiny and is growing real well. Im a person seeing is believing , so Im here to say it really made a big difference in my life ! Staying on it faithfully.